The Garden School Foundation is dedicated to providing an interdisciplinary program of education through garden-based learning in outdoor living classrooms. Since our humble beginnings in 2003, Garden School Foundation has grown into a thriving, community-based program. We’ve developed our comprehensive Seed to Table garden-based education program at the 24th Street School that includes monthly, standards-based lessons that focus on a unique subject in each K-5 year. 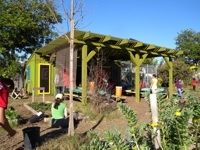 Our prototype garden classroom is located at the 24th Street Elementary School in the West Adams neighborhood of Los Angeles. Hear what the teachers are saying about GSF!